Hank turns one on Saturday, he’s now on grown-up food and we’ve released him from his “bedroom” pen and let him have the run of the conservatory. Time will tell if this is a terrible idea or not. The time has definitely flown this past 10 months, looking back at photos he was super tiny cute. I bemoan that I miss my little wiggly puppy that I could scoop under one arm and then I remember the interrupted nights of toilet training and my belief that puppies are made cute for survival reasons as they are so incredibly trying right at the start. Still, Hank decided to jump up onto my shoulder and attack my hands whilst out walking yesterday morning on a busy road because he hates my gloves and got overexcited when we had to run across said road, so he’s still immature and embarrassing, even at 23kg. I really must update “his” blog, it’s been a long time, i.e. 6 months! It’s going to be a long post to catch up. This weekend it’s EMMQG weekend again, and I’m going to do a bit of a Q&A session on EQ7. I’m by no means an expert but I’ve been using it a couple of years so I think I’m pretty good on the day-to-day stuff. But my plan other than sitting with my laptop is to start improv piecing some of the odds and sods in my orphan block drawer together to make the top layer of a pinafore dress I am making for the Quilt and Stitch Village show. I’ve decided to call it the “Junk in the Trunk” dress. Here’s some of the candidates though I also have some bee tops that are tempting, but not all my own work. I may throw some new kaleidoscope blocks and HSTs in there if there’s not enough to go on. I then plan to roughly cut out what I need for the pattern pieces, layer with wadding and thin muslin and baste the layers together as well as cut out the actual pattern pieces. I need to make a lining as I go too, I’ve never made a lining before. This could be the worst idea I’ve had for a quilt show entry, or my best. I thought I might be in with a shout if I picked the least popular category! I also need to write two articles this week and finally empty the email folder full of blog comments that I’ve not replied to, I’ve been awful the past fortnight. I appreciate reading them so you deserve replies! 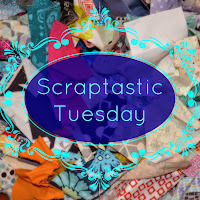 Hopefully this post isn’t too tenuous to link up with Scraptastic Tuesday- for the blocks of course! Wow that’s a plan! I hope you show us the result. And tell us how you got on in show. We love the tenuous at #scraptastictuesday! Don’t forget Siblings Together if looking for something to do with spare tops and blocks! That will be some dress! You are so busy these days. I spent yesterday appliquéing the poppy block and almost finished the rose. Slow progress but I have 3 more backgrounds done too. Wow to both plans – that is some seriously complicated quilt and I can’t wait to see your dress! What a fabulous quilt design! I haven’t used EQ since 1 (DOS-based) which was very cumbersome. Your design inspires me to think seriously about getting the latest version. The dress is such an interesting plan, too. I’m so intrigued you’re using a fairly fitted pattern. Can’t wait to see your progress. Happy birthday Hank, hope you’re both enjoying the weekend now!